Last year, Green Bay Packers quarterback Aaron Rodgers made a surprise appearance during Brad Paisley's tour. Think he'll do the same thing this year? Get your Brad Paisley Bradley Center tickets and find out! In all seriousness, Brad Paisley is one of country music's hottest stars. With 20 number 1 hits, three Grammys, and the title of CMA Entertainer of the Year in 2010, Brad Paisley is riding high in the country music world. If that's not enough, Paisley also wrote a book called Diary of a Player. 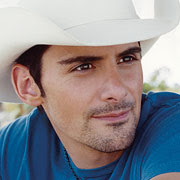 Brad Paisley will be stopping in Milwaukee, WI and performing at the Bradley Center on Friday, January 13, 2012 as a part of his "The Cowabunga! 2012 World Tour." You won't want to miss this show, especially if you are a country music fan.